Holiday.gr - Amorgos chora, a trip to a myth! 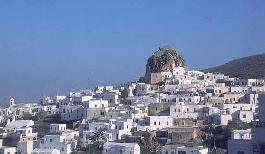 Chora, the medieval capital of the island is built in a 300m height around the Enetic's castle rock. It is 5km far from Katapola, the island's port and impresses every visitor with its graphic and well-saved architecture. Chora is a live sightseeing. The medieval settlement with the old houses keeps the tradition live from generation to generation. The hundreds byzantine churches you see as you walk around Chora reveal the island's history through centuries. Most impressive in Chora, are the three Towers from different periods of time that gratify the baronial, mysterious and romantic part of Amorgos. In the north side of Chora is located the Tower from Hellenistic times. In the south, next to Saint George's church the visitor can see the venetian past of the island. The Enetic Tower is typical of the island monuments. It was built during the 13th century and is saved in a good condition. The third Tower, known as the Tower of Gravia, is typical of the mansions from the 18th century. It hosts the archaeological museum of the island. The beaches near Chora are known for their clear waters and wild beauty. The beach with pebbles of Agia Anna surrounded by rocks and the beach of Kambi are good alternative suggestions for swimming. In the north part of Agia Anna village and in 300m height is literally stuck in rocks the monastery of Hozoviotissa. The most important religious monument and among the greatest monasteries in Greece. Your stay in Chora will be unforgettable. The hotels provide their guests all comforts. Opportunities for entertainment are many and satisfy all tastes. Been to Amorgos chora ? Share your experiences!